I hope you will indulge me as, for yet another time, I speak about myself towards the end of this post. 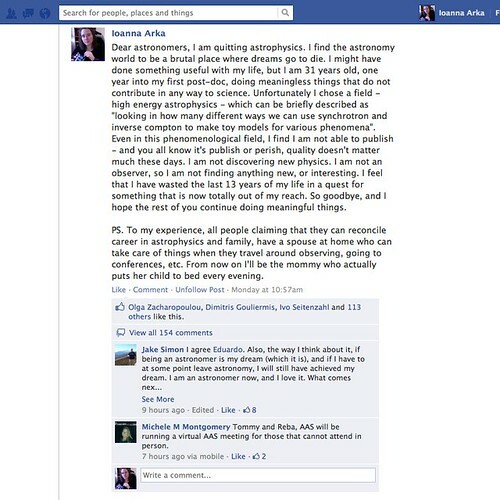 Rest assured, I’m not doing this to gather popularity or sympathy, but rather because I suspect that there are many astronomers out there - male and female - who face issues similar to mine but are not able to vocalise them. I’d like to be candid about my experience in academia and without, and maybe if some of you can relate a little to my experience, you’ll get some ideas on how to proceed with your academic and non-academic professional pursuits. To cut a long story short, I was upset with the insecurity and family incompatibility of an astronomy career. Therefore, I concluded to quit astronomy research and look for a job in industry. Being an expert on statistics and machine learning, I figured I would encounter little or no problems to find a job outside astronomy. I was grossly mistaken. In my numerous applications and job interviews, a clear pattern emerged: Industry almost always searches for the perfect candidate - the milk-giving, egg-laying, wool-growing pig. They would always request subject-specific experience. I had years of experience in astrophysical data analysis - but what about business data analysis? What about financial data analysis? No? Sorry, we found someone more experienced (less in statistics but more in the origin of the data). Bye bye research. So now what? This article is relevant only for natives of EU member states! Apologies to all non-EU JfA members. Recently a JfA member, Matteo, brought to my attention the whole span of jobs that are offered by European Union institutions. First of all, let me say that although I have included some useful (or not? You will be the judge of that!) links in the JfA website, to really get acquainted with the way EU institutions work and are interrelated is, to say the least, a challenge. If you have ever tried to apply for a Marie Curie Fellowship, you have an idea what I mean. Even websites seem to be convoluted, the jargon is confusing, more often than not using big words and long sentences to let you know something as simple as "this is a managerial job". So if you want to work for the EU, my first piece of advice is: don't get spooked by strange lingo. You'll get used to it. Today we are hosting a guest post by Dr. Tessel van der Laan. Tessel obtained her undergraduate degree in astronomy from the Kapteyn Institute in The Netherlands, before moving to the Max Planck Institute for Astronomy in Heidelberg, Germany, for her graduate degree. After obtaining her astrophysics PhD (with honors) in 2012, she moved to Grenoble, France, where she is a post-doctoral fellow at the Institute for radio astronomy (IRAM). Besides astronomy, her passions include history, politics, psychology, art, and good food. Last weekend I sat down with two people that work in politics/policy. I discussed with them the possibilities that exist for astronomers in and around the political process. Our discussions focussed mostly on me, but many of the things they told me, are equally applicable to you. So, here goes. Welcome to the JfA blog! We are launching the JfA blog today, in the hope that it will become a platform for further sharing of information and communication within our small (but constantly growing) community. I hope that we will have many guest posts and reports in the future from JfA members. If you'd like to contribute a longer version of your job search story, please contact me at contact@jobsforastronomers.com in order to arrange for a post. We have already read some success stories in the facebook group, but many are also interested in those stories that share the difficulties of searching for a job after working in academia. I have been contacted by some former astronomers who have been searching unsuccessfully for a job for quite a while, and I urge those people to also share their experience through the JfA facebook page and through this blog.